The WhatsApp video calling feature is truly an innovation worth applause. In a world where technology is bringing people together, WhatsApp has acted as the transparent string that holds them close to each other. In simple terms, keeping in touch has never been so easy! For those of you living under a rock, a WhatsApp call is a video and audio calling feature extended to all members of the WhatsApp community, which allows users to video chat in real time. The feature was introduced on November 14th, 2016 and shook the minds of everyone who was able to experience it. In fact, the best part is that WhatsApp keeps a check on the quality of calls being placed through its calling and video calling features, by asking for an immediate feedback once you cut your call. This helps them engage with the users and constantly better the quality of video delivered at your internet speeds of choice. Be it long distance calls with a loved one or family, or group video calls with friends or colleagues, WhatsApp has transformed the way Android users looked at and experienced video calling. The iPhone users, fortunately had their stint with video calling at the touch of a button with the FaceTime feature. In the process of video calling with family or friends, you may want to keep those warm and wonderful clips, but this requires some third-party tools. Next, I’ll show you some of the high-rated WhatsApp video call recording apps, as well as the specific steps to record WhatsApp video calls on Android and iPhone. Multitude of uses: The WhatsApp video call is no strange occurrence today. Users are implementing their finest innovation skills and hosting entire discussions of official as well as unofficial nature on WhatsApp. These thoughts exchanged, and ideas stated can help if recorded. Keeping in touch: Be it with your mom if you live in another city, or a spouse when you’re away on business trips, WhatsApp calls can be placed from any location where you have access to the internet. WhatsApp then uses your internet connection to place calls to all your contacts without any hesitation! Desktop feature: WhatsApp is a helpful application and since its web version has been launched, its importance has increased fourfold. The relatively new WhatsApp Web feature allows you to download the desktop version of the app on your laptop computer, and with the simple scan of a QR code, you can be logged in, chatting, calling and even video calling on WhatsApp! Saves money: Gone are the days when a student traveling abroad for his education had to wait in cyber cafes and pay heftily to make a call to his parents. If we were lucky, some of us had the Yahoo! 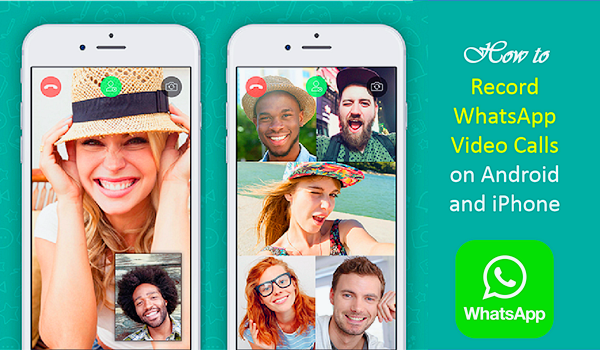 Chat app which allowed video calling at exorbitant rates. WhatsApp has transformed this scenario and has made it even easier to communicate with our dear ones even if they live on another continent! Plus, all you pay for is the amount of internet you have consumed! Knowledge transfer: When outlets like Skype and other video chatting fail in the scheme of knowledge transfer sessions such as tutorial chats, sessions with a therapist, any motivational counseling, WhatsApp Video Calling comes in and saves the day! With WhatsApp’s end to end data encryption move, recording these sessions can be undertaken without any hesitation. 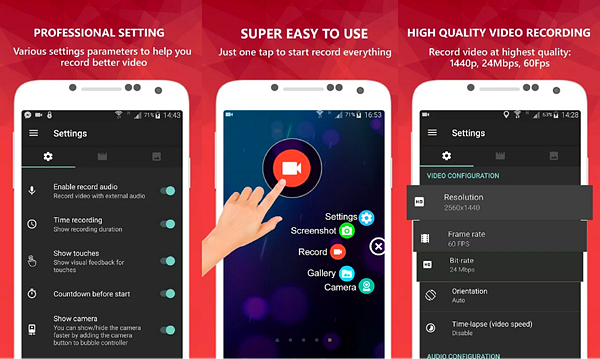 One of the best and most trusted screen and call recording apps for Android on the Google Play store, DU Recorder can help you record everything on your phone screen with just one tap. No limit on the size of the video. Options for High Definition videos. Fluid video recording with features like pausing, resuming, displaying click operations on the recording, brush feature to draw on the screen, etc. Video Editor enables you to adjust and tweak, add subtitles, background music, add intros and outros, combine videos, trim and edit of final video recording, convert videos to GIF and more. 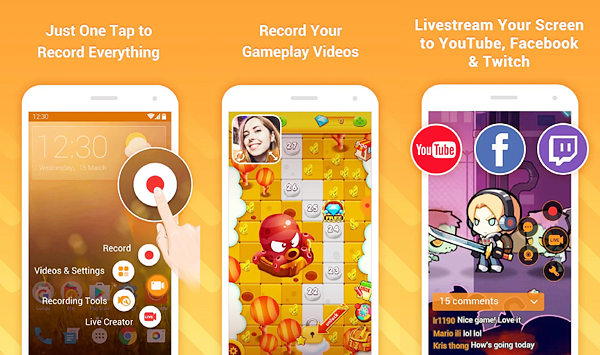 Live Creator – This feature allows the user to stream their screens to other social media applications such as Facebook, Twitch, and YouTube. It lets you control the quality of the stream, lives tream privacy, audience comments and use of the front camera. Screenshot and Image Editing – The DU Recorder also takes screenshots, and allows for quick and easy editing. As the name implies, it allows you create a recording of your phone. And the best part about this application is that it captures both the audio and the video in a single frame, which making it the best app for recording WhatsApp or Facebook video calls. The AZ Screen Recorder has no time limit on the size of the video recording. No watermarks appear on the recording screen of the finished product. The app provides for HD and FullHD video settings to be tweaked. Settings Available – Resolution, bit rate, screen orientation, viewing, sharing or deleting recording videos. Magic Button – This button controls the recording, but does not show up in the recorded product. Overlay Front Camera – The app records the front camera in a small screen window which can be dragged across the screen. Countdown – A countdown timer appears on the screen before the phone screen begins to record. Draw Function – The AZ Screen Recorder allows you to draw on the screen while the video is being recorded. Trimming and Editing – The video call recorder also allows video editing and trimming of the information which is not relevant. Live Stream – Screen recordings taken on AZ Screen Recorder can be streamed on any platforms you wish to stream on such as Instagram, Facebook etc. This app can record your calls and conversations in the best possible quality. It enables you to record calls from a variety of social media applications. The recording is automatic and users can create a list of selected contacts that they want to automatically record or exclude. 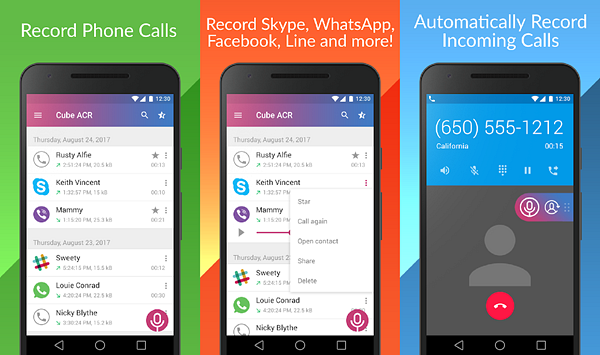 It supports to record video calls on WhatsApp, Skype, Facebook, Hangouts (Google), IMO, KAKAO, Slack, Telegram, Viber, etc. The video call recorder for Android automatically records all calls and sends the recorded files to your Google Drive. Pin locking system inbuilt with the app protects the recording with a pin which is to be entered to view them. Recording can also be started mid-call to record parts of conversations of contacts. This WhatsApp video call recorder records in MP4 format and quality can be changed. Post call actions such as playing, sharing or deleting can be done as soon as the call ends. Works on tablets and cellular devices to record Skype, Viber and WhatsApp, and other VoIP conversations. Step 1. Download and install any of the video recording applications mentioned above on your Android phone and run it. Step 2. After that, a floating widget will appear on the screen, it is small, does not take up a lot of screen space, and can be easily accessed by touch. Step 3. To record a WhatsApp video call, just find the floating window while you are on a video call and press the Record button. Step 4. You can pause or stop recording at any time. Once the recording is complete, you can abandon, edit or share the recorded content with your friends. Useful tip: If your WhatsApp messages get lost or deleted from your Android phone, you can quickly get them back by using Gihosoft Free Android Data Recovery Software. It works with multiple Android devices, such as Huawei, Samsung HTC, LG, Google Pixel, Motorola, OnePlus, etc. Here is a simple guide on how to recover deleted WhatsApp messages on Android. iPhone users do not require to purchase or download a video call recorder in order to record their WhatsApp video calls. This is due to the in-built function of the phone, which is available in all models which function on iOS 11 system. But first, you require enabling this feature in your phone. Open your phone’s screen and open the ‘Settings’ option. Now, tap on ‘Control Centre’ and then go to ‘Customize Controls’. Keep scrolling down to the option that says ‘More Controls’ and punches the green plus sign appearing next to the option that says ‘Screen Recording’. 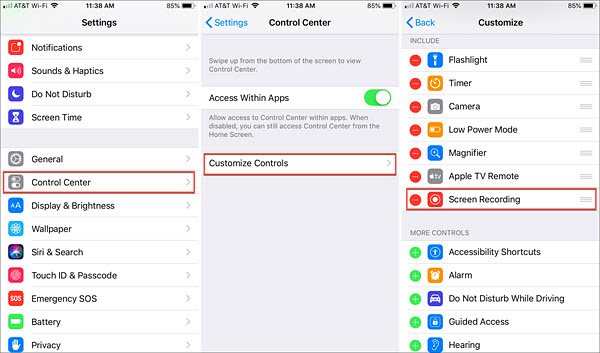 This will add the screen recording button to your Control Centre. When you swipe up from the bottom of the screen now, a red button will appear on the Control Centre. However, if you want to enable sound to be recorded on the video, you can long press the Screen Recorder button, and a menu will appear to allow you to enable Microphone Audio. Once the Screen Recording button is pressed, a countdown begins for three seconds and then the screen begins to record the video activity on the screen. The best indicator would be the change of color of the status bar at the top of the screen. If you wish to stop recording, simply press the Screen Recording button again. Relatively easy? It has to be! Apple software is user-friendly and amazingly simple to change controls to your liking. Recording your phone screen is a much easier and more hassle-free experience when you use video call recorders which can support it! Whether you wish to upload these videos on streaming sites, or make videos for any intent or purpose, this comprehensive list is sure to see you right through!